Providing Google Maps of tour venues seems to be an emerging trend for rock bands. Recently Google Maps Mania has featured Google Maps mash-ups by the Chemical Brothers and Unlit, now Oasis have produced a map showing their upcoming gigs. Both the Chemical Brothers and Unlit made full use of Google Maps' abilities to include muti-media. The Chemical Brothers allowed fans to add videos and photographs from concerts to their Google tour map and Unlit embedded videos from YouTube, photos from Flickr and updates from Twitter in their map. The Oasis Tour Map however is a fairly straightforward map that just shows the locations of the band's upcoming concerts in North America and Europe. 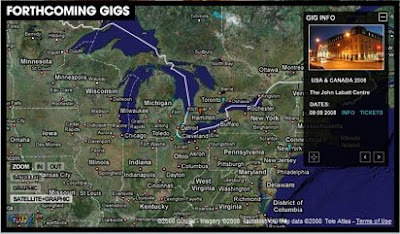 Each of the gigs is tagged on the map and clicking on a tag reveals the details of that particular gig. The map is therefore not quite so dynamic as the Google Maps from the Chemical Brothers and Unlit but if you just want to know where the nearest Oasis gig is then this map will certainly help. Thanks keir for the always good stuff.